Pothos, also known as Scindapsus aureus, has attractive, heart-shaped leaves and is a nearly indestructible houseplant that is perfect for beginners or forgetful gardeners. Despite the plant's toughness, occasional problems can arise that often manifest through yellowing of the leaves. Pothos is also known as devil's ivy. Pothos' leaves will often turn yellow when the plant is exposed to too much light. 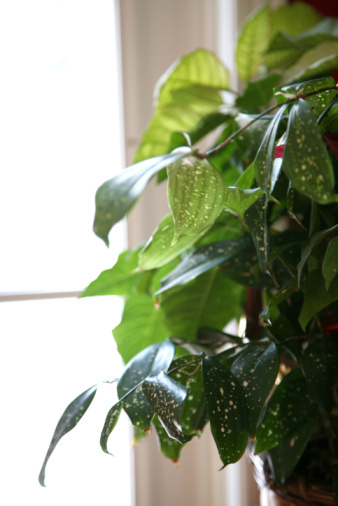 Pothos requires low or moderate light and won't tolerate direct light, which will scorch the leaves. The plant should be moved farther away from a bright window, or a sheer curtain should be used to diffuse the light. An infestation of spider mites, which are tiny insects that hide on the underside of the leaves, can give pothos' leaves a yellow, ragged appearance. Plants infested with spider mites are sprayed with a stream of lukewarm water to dislodge the pests. The plant is then sprayed with an insecticidal soap. Too much or too little fertilizer can cause pothos' leaves to turn yellow. Pothos, a slow-growing, non-blooming plant, isn't a heavy feeder. A monthly application of a water-soluble fertilizer for indoor plants is adequate.